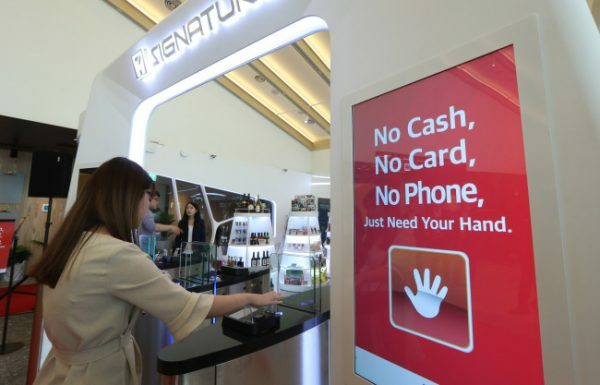 A new payment system, which seems like something right out of a science fiction movie, has officially launched at a 7-Eleven in Seoul’s Lotte Tower – the tallest building in Korea, and one of the top 10 tallest buildings in the world. The newly launched “smart store” will use a system called BioPay to allow customers to make virtual payments for their purchases. The BioPay system allows clients to identify themselves through scans of specific body parts which have been linked to their credit cards as a form of identification. In this particular case, the store chose to use the sophisticated “HandPay” system over other choices like retinal scans or fingerprint identification, as the owners felt it would be the quickest and most convenient option for their customers. The system simply scans the client’s palm vein patterns to establish their identity, and then automatically makes the link to their credit card for payment. To benefit from this payment system, customers will have to have a Lotte Card – at least initially. Lotte is a massive Korean distribution conglomerate with a wide range of business interests, and 7-Elevens in Korea are a joint venture between Lotte and the U.S.-based 7-Eleven organization; they are collectively known as Korea Seven. The company hopes to offer the HandPay system to customers not using the Lotte card by the end of August this year. The entire store requires few to no staff members – not necessarily good news for the future employment of local workers, of course. The whole system is being tested by Lotte employees for the first two months before being rolled out to the public, so that any necessary issues can be ironed out. Though the company has refused to commit at this point, it is likely that the system will be expanded to other 7-Eleven and Lotte subsidiary stores in the near future. What do you think? Are unmanned, hi-tech stores likely to arrive on U.S. shores soon? What are the security implications of biometric authentication? And what might the impact of such technology be on the country’s unemployment figures? Apart from any other concerns, it might be quite sad not to have anyone to chat to at the checkout counter anymore.